THE ISLANDS PICTURED in these pages are so small, it’s hard for a lifelong continent dweller like me to imagine them as the whole space in which people—around 75,000 in the Marshall Islands, 393,000 in the Maldives—reside. 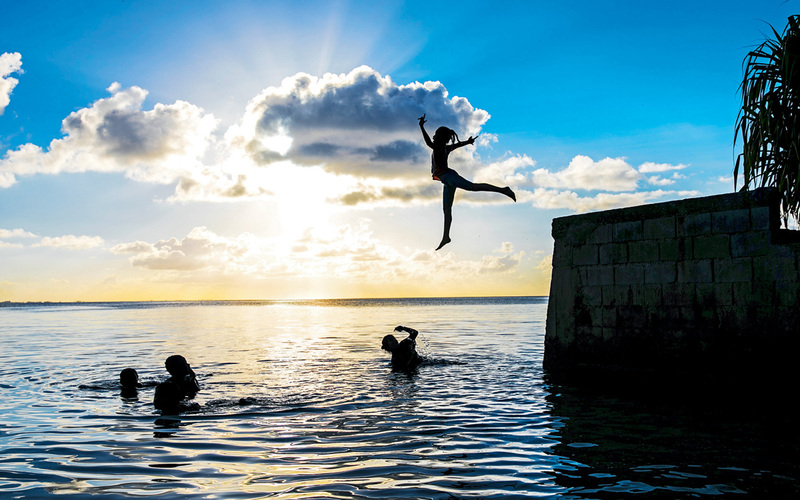 But Dan Lin, who has spent years with the people of the South Pacific, assures me that many island dwellers see themselves as living not in the confined space of islands but in the vast space of archipelagoes in the boundless expanses of the sea. 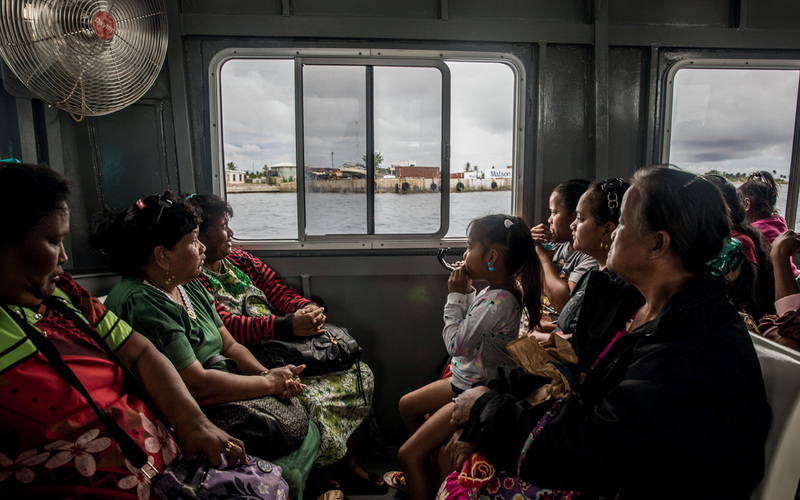 Looking with his eyes, I see that the land in the Marshall Islands is akin to the city, the sea to the country, but the land has become so crowded and overburdened that it is like an inner city, a slum—density amid vastness, crowding wrapped around by the sea. 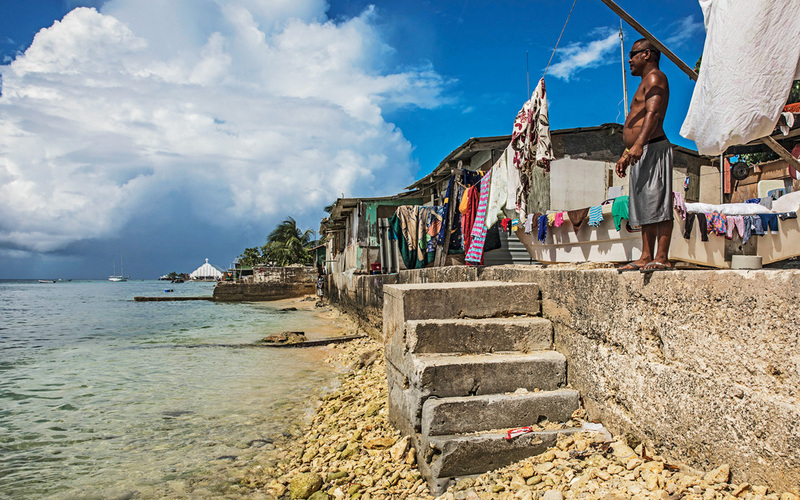 ON EBEYE, THE MOST POPULOUS OF THE MARSHALL ISLANDS, THE INCOMING TIDE IS YOUR FRONT YARD. These tiny, low-lying islands are also sanctuaries, because even the most marine-adapted people, even the great navigators of the South Pacific, need land. They are now losing what they need. Eventually, the Marshall Islanders will lose all of it because of what others far away have chosen to do and not to stop doing. According to Yoster, a pile of sand and rocks that was only a few feet away, called Ellekan, was once a full island. 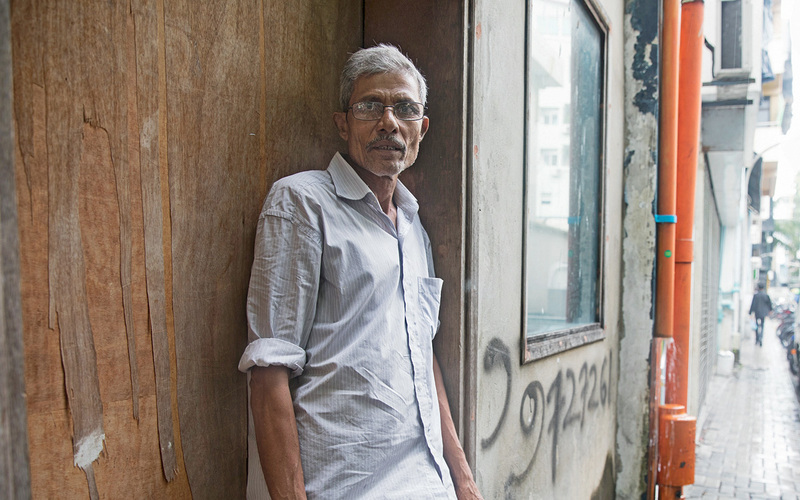 He said 10 years ago it was lush and full of coconut and pandanus trees—that he used to walk across the reef at low tide and sleep and camp there overnight, sometimes even finding crabs to bring back to eat. He said 10 years later, because of the constant high tides washing over the island, it has become barren. This, according to Yoster, is all a result of climate change. He said in Marshallese, “We’ve had the funeral for that island—it’s over. But you need to save the others.” I came away from the experience feeling the weight of Yoster’s appeal as well as the chilling realization that the pile of sand and rocks that was once an island is exactly what the rest of the Marshall Islands could look like in a few years. Jetnil-Kijiner notes that in 2016, five islands vanished from the Solomon Islands, another huge archipelago nation of tiny specks of land, this one about a thousand miles northeast of Australia. The islands were small and uninhabited, according to the Guardian, but six other islands there were ripped at by the sea, and one has lost half of its inhabitable area. The erasure of islands and remaking of our atlases is already under way. 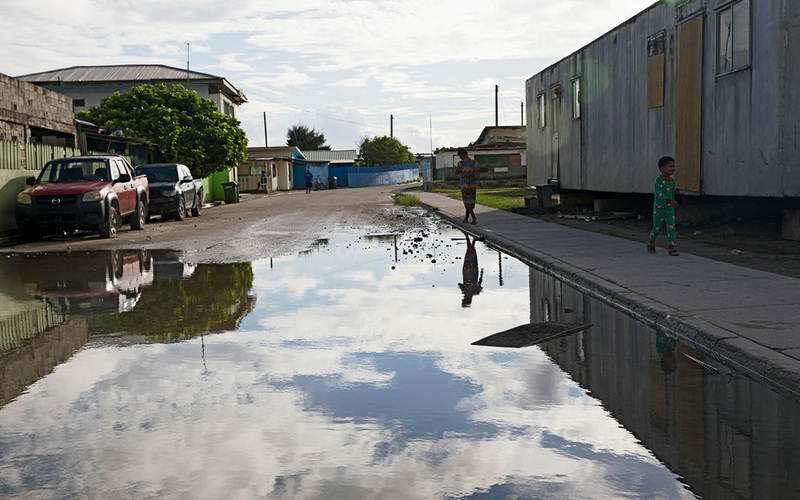 FROM LEFT: A FEW HOURS OF RAIN IS ENOUGH TO FLOOD THE STREETS OF EBEYE; A FERRY FROM KWAJALEIN ATOLL; KIDS AT PLAY IN MAJURO LAGOON. You can see how crowded these islands are, how little room there is, how the sea is all around, how low the land is, how easily the sea sweeps over in a storm surge, how in most places nothing stands between the land and the water. The paradoxical thing about sea level rise is that it is not only a problem of too much water; it’s also a problem of not enough. The rising seas turn the precious freshwater sources on the islands brackish, and without freshwater, growing plants, watering livestock, and quenching human thirst is frustrated. The rising seas tearing away chunks of land is similar to what’s happening on the low-lying, fragile Louisiana coast, which has lost an area the size of Delaware to erosion over the last several decades. In Louisiana, the first official United States climate refugees were resettled away from the disintegrating coast in 2016. As is so often the case with those impacted by climate, they were indigenous people—the Biloxi-Chitimacha-Choctaws. You can move inland on the continents; on these islands, inland is not enough. You have to imagine what you cannot see, and this work of invention has always been a central part of what environmentalists do: imagine ecosystems, imagine consequences, imagine places we have not been to and cannot see, imagine the future. Being an environmentalist is first of all a commitment to others, to human beings who are not in the here and now, to other species, to the future; this commitment comes from a fact-based faith in the beauty and value of the complex systems that sustain life. 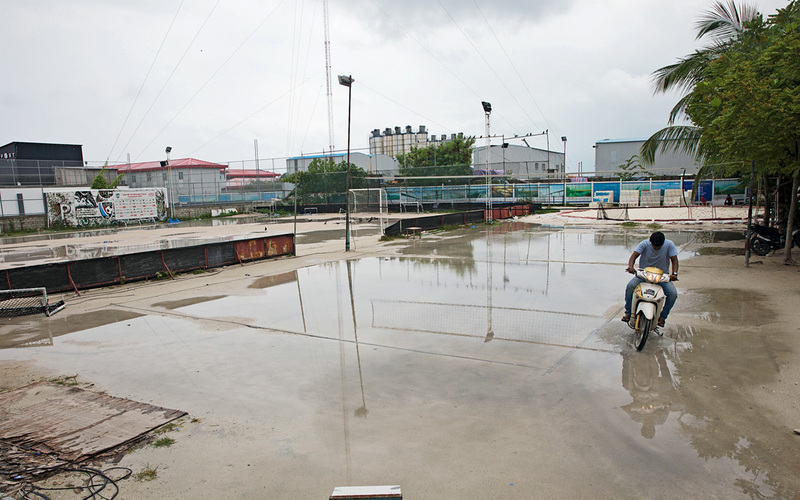 A SHORTCUT ACROSS A FLOODED SOCCER FIELD IN MALÉ, THE DENSELY POPULATED CAPITAL OF THE MALDIVES. To understand the doom of the islands, you have to imagine the melting of ice sheets in places far from the tropics. And to understand the ice sheets melting, you have to understand the greenhouse gases trapping heat in the atmosphere, and to understand those gases, you have to imagine the emissions produced by a variety of means, but most of all by burning fossil fuel and pushing carbon out of the earth and into the sky. 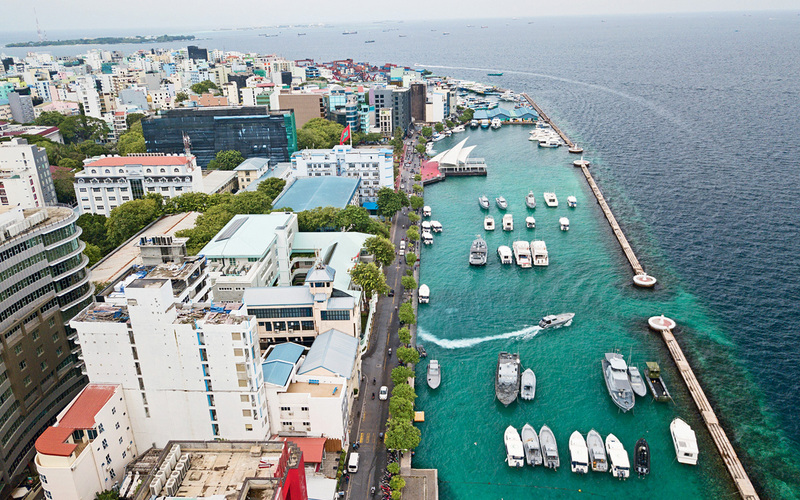 What is happening to the islands is the result of decisions, profits, and benefits made and pursued by others, far away—which includes most of us. For a long time we thought the work of climate change was imagining the future, until we realized that all our estimates were too optimistic and that the trouble was not an issue for our grandchildren but was in the present, with us, now. Even to imagine the present means summoning up the reality and the necessity of systems too vast and complex to appear before the eye. We in the safer center had to imagine the edges—the islands, the poles, the ice sheets, the glaciated heights. We had to add to our picture of the world sub-Saharan droughts, tropical storms, ocean acidification, melting permafrost far away from our everyday lives. Then came droughts, floods, wildfires, polar vortices, pumped-up storms, and we only had to incorporate the evidence of our eyes and daily lives into the larger narratives of how things were changing. 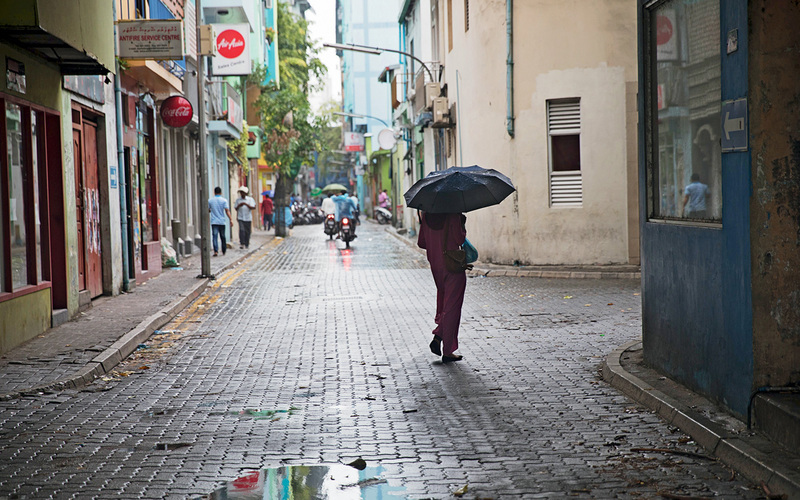 FROM LEFT: MALÉ’S COASTLINE; THE CAPITAL IS ONLY A DOWNPOUR AWAY FROM A FLOOD; A MAN STEPS OUT TO CHECK THE WEATHER (IT’S STILL RAINING). Words—as testament, story, and scientific explanation—and maps and photographs all helped us do this work of the imagination. Even so, I think that most of us fail to imagine how dramatic the changes are and will be. In the future, the world that older people like me grew up in—a stable world of predictable seasons and thriving systems before chaos began to break apart the great chains of being—will be what the young have to imagine, because they will no longer be able to experience it firsthand. On the continents, much will change, but not everyone lives on continents. Many maps show that sea level rise will impact Miami, New Orleans, and New York City, and that the Pacific will push its way up past San Francisco Bay to flood California’s Central Valley, one of the richest agricultural areas on Earth. But I have not seen the maps that show us where whole nations used to be, entire bodies of land that are doomed, and where the process of drowning is already under way. That’s what Dan Lin’s photographs testify to here. This article was funded by the Sierra Club’s Beyond Coal campaign. LIKE WHAT YOU READ? SIGN UP FOR DAILY UPDATES FROM SIERRA MAGAZINE. By signing up, you are opting in to receive periodic communications from the Sierra Club. Rebecca Solnit, a Sierra Club member since 1986 and a product of the California public education system, is the author of 20 books and a dedicated walker and camper and protester.